Tyson Foods is a U.S. based supplier of beef, chicken, pork, and prepared foods. Trade tensions between the U.S. and China have resulted in weak pork prices in North America in H2 2018 and Q1 2019. Tyson Foods should be able to experience margin expansion thanks to expected pork demand from China due to the African Swine Flu. 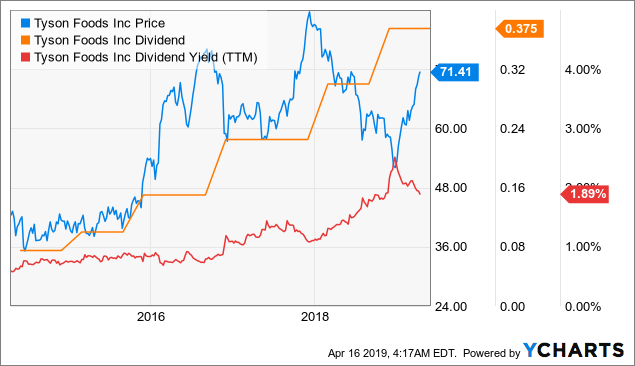 Tyson Foods offers a 1.9%-yielding dividend. 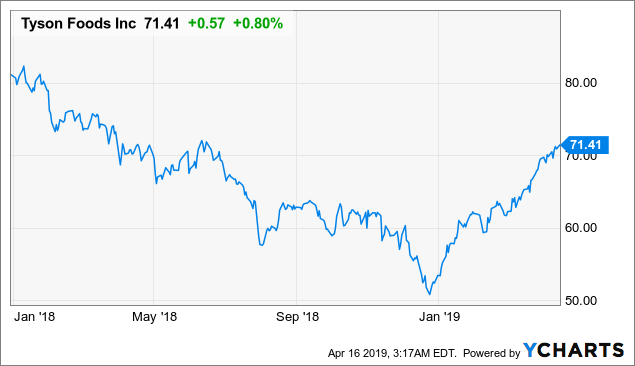 Tyson Foods (TSN) had a tough Q1 2019 due to unfavorable meat prices. China's imposed retaliatory tariffs on United States fresh pork has resulted in margin compression of its business. Nevertheless, future outlook looks bright as demand for North American pork is expected to rise due to the spread of African swine flu in China. A trade deal between the United States and China will likely also lead to a removal of tariffs by the Chinese government. This should spark demand for North American pork. However, Tyson Foods' share price appears to be fairly valued. While there is still upside potential, investors may want to wait for a better entry point, or seek opportunities elsewhere. At the moment, we feel Maple Leaf Foods (OTCPK:MLFNF) has a better risk/reward ratio than Tyson Foods. Investors may want to check this Top Idea article (click here) we have written on Maple Leaf Foods. Tyson Foods delivered poor Q1 2019 result. Its sales declined slightly by 0.4% to $10.2 billion. Its adjusted operating income fell to $841 million in Q1 2019 from $950 million in Q1 2018. The decline was primarily due to a drop in its operating margin. In Q1 2019, its operating margin declined to 8.3%. As can be seen from the table above, beef margins of 7.8% was pretty strong. In fact, it was better than Q1 2018’s 6.6%. However, pork margins declined from 11.8% in Q1 2018 to only 8.1% in Q1 2019 primarily due to lower fresh pork price. The challenging pork margin was primarily due to the Sino-U.S. trade war where China imposed retaliatory tariffs on United States fresh pork. This has in turn caused a decline in demand for fresh pork in North America in H2 2018 and Q1 2019. The outbreak of African swine flu in China is expected to result in a shortage of pork for a lengthy period of time. This is because once swines are infected by the flu, the death rate is nearly 100%. According to U.S. Department of Agriculture calculations, the total herd in China will fall from 433 million head in 2018 to about 374 million over the next 12 months. This would represent about 59 million head or 13% of China’s vast pig herd. The flu is still not controlled in the country and there could be more deaths of pig herds than anticipated. Pig industry analyst and commentator Peter Crichton suggests that China’s pork imports may have to double in 2019 to supply the lost production and recover the breeding capacity. The fact that this disease is difficult to control also means that this situation is likely to continue in the next few years. The reality is that there is not enough meat in the world to fill the shortage. 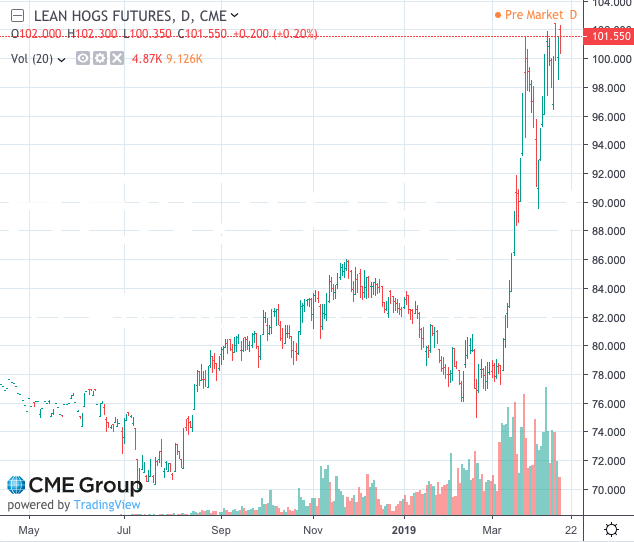 In fact, we are already seeing a spike in the price of hog futures (see chart below). Since it is difficult to fill the gap of this shortage, China will likely also increase imports for all other sources of protein such as chicken or beef. This means we should also see the prices of other meats going up. This will create a favorable situation for Tyson Foods as it processes different types of proteins. For readers’ information, beef represents about 37.4% of its total sales in 2017 followed by chicken’s 28.8%, and pork’s 13.2%. 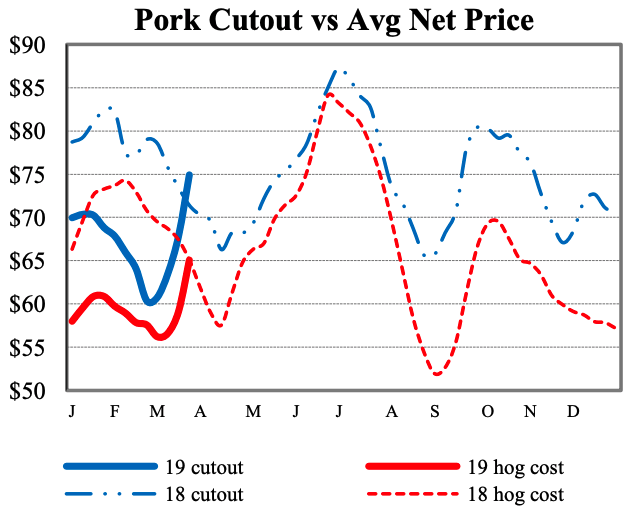 Below is a chart that shows the pork cutout price vs. live hog price. As can be seen from the chart, the spread (the difference of cutout price and live hog cost) has become much wider since late February 2019. In fact, the spread has widened from about $3 in late February 2019 to $10 in late March 2019. We expect this favorable spread to continue throughout the year. 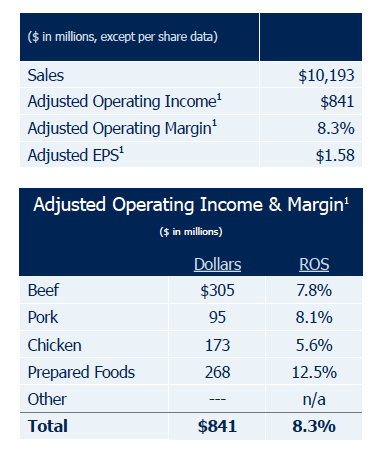 This should allow Tyson Foods’ margin to expand. Trade tensions between the United States and China have resulted in China imposing tariff on meat products imported from the United States. For example, China imposes 62% tariff on all pork imported from the United States. China and United States have been negotiating a trade deal for months. We expect once a trade deal is signed, China will remove the tariff on meats. Due to the outbreak of ASF, China will likely import massive amount of pork from the United States to fill the supply gap. In fact, China has already imported over 77 thousand tonnes of pork from the United States during the week of March 28-April 4, according to the latest USDA data released on April 11. The 77 thousand tonnes of pork exported to China is the largest amount in a single week since 2013. The demand for pork will likely result in a surge in pork exports to China from the United States once a trade deal is signed. Tyson Foods will benefit from this and should see significant growth in pork exports. Not only will pork exports increase, beef exports and chicken exports will also increase as well. We expect improvement of Tyson Food’s margin. Share price of Tyson Foods has surged over 33% since the beginning of the year. 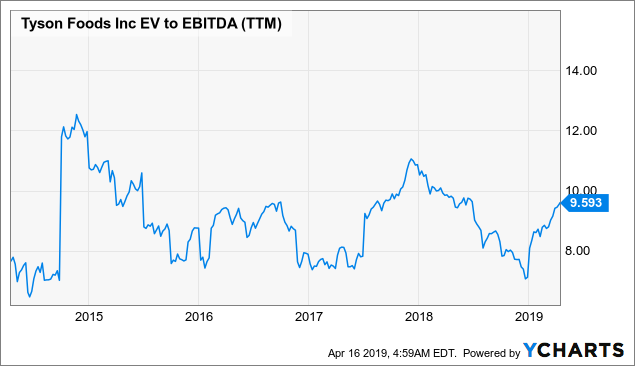 As a result, its EV to EBITDA ratio has also surged by over two multiples to 9.6x. Its current valuation is about 0.6 multiples higher than its 5-year average of 9.0x. We suspect the market has at least partially priced in a possible trade deal that will eventually result in a surge in its sales expansion in its EBITDA margin. Tyson Foods pays a quarterly dividend of $0.375 per share. This is equivalent to a dividend yield of 1.89%. As can be seen from the chart below, the company has consistently increased its dividend in the past few years. Its current dividend yield of 1.9% is towards the high end of its 5-year yield range. We believe Tyson Foods will continue to perform well thanks to strong pork demand, especially from China. While we think its share price may move higher if a trade deal is signed, its shares are currently trading at a valuation above its historical average. The market appears to have at least partially priced in the benefit of a trade deal. Share price of Tyson Foods will likely continue to trend higher. However, investors might want to wait for a pullback. At the moment, we recommend Maple Leaf Foods over Tyson Foods as Maple Leaf Foods appears to have more upside potential. Investors are encouraged to read our article Maple Leaf Foods: Margin Expansion Will Drive Solid Growth. This article has also been selected by Seeking Alpha as a Top Idea article on April 4, 2019. Disclosure: I am/we are long MLFNF. I wrote this article myself, and it expresses my own opinions. I am not receiving compensation for it (other than from Seeking Alpha). I have no business relationship with any company whose stock is mentioned in this article.